Google's mobile OS gets fruity, but has Image-Line managed to squeeze an acceptable level of performance out of it? If you're got a decent Android device FL Studio is worth looking at, though you'll need to accept that it has certain limitations that may not be removed any time soon. FL Studio Mobile's step sequener will be familiar to users of the desktop version of the software. The problem with Android music-making is well documented: due to the way the OS is designed, it's very difficult to create real-time audio applications for it (you'll often hear a distinct lag between pressing a note on an onscreen keyboard and hearing it sound, for example). 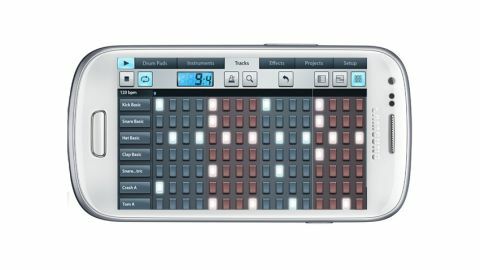 As a result, very few of the big-name iOS apps have made it over to Google's mobile platform, so when Image-Line announced that it was to release FL Studio for Android, a lot of users got very excited. In terms of look and feel this is very similar to the iOS version of FL Studio Mobile, which itself is derived from Xewton's Music Studio. It's a self-contained music production platform that enables you to create projects using a selection of built-in sounds (there's no audio recording option). The app's various windows are accessed via tabs displayed across the top of the interface. These enable you to open up a touchable and resizable keyboard or a bank of onscreen drum pads; an instrument browser; a Tracks display (which is also your main note editing hub); an Effects panel; and windows for managing your projects and making general app setup changes. The soundbank (which comprises 133 instruments, drum kits and sliced-loop beats) leans towards the electronic, though it's just presets that are on offer, and these can only be edited to the extent that you can adjust attack and release times. Tracks can be created by using the familiar FL Studio step sequencer, by inputting notes on a piano roll or, in theory, by recording in real-time using the aforementioned onscreen keyboard or drum pads. We say 'in theory' because, perhaps unsurprisingly, FL Studio Mobile for Android still suffers from that latency problem. Using our test device, a Sony Xperia U, recording parts in real-time was pretty much impossible, though better results could be achieved by slowing down the tempo and using the auto quantize option. Image-Line tells us that the latency level varies from device to device - it quoted us a figure of around 70ms for a Google Nexus 4 - but it's clear that there's still an issue here, and you may have to accept that your projects will have to be constructed by drawing notes in rather than playing them live. This is hardly Image-Line's fault, but it is a shame that there's no demo version available so that potential users can test the app on their device before paying £12.95/$19.99 for it. Once you've got over the latency hump, the good news is that FL Studio represents one of the better music making experiences that Android has to offer. The sounds are fine; there's no way to add more as things stand, but an in-app purchasing store is on the way, we hear, as are the options to import .instr files created with FL Studio or FL Studio Mobile for iOS, and to create custom drum kits from samples. "It's a shame that there's no demo version available so that potential users can test the app on their device." As for the workflow, once you've got used to the way the sequencer works, getting a song together is relatively straightforward. There are a few quirks, and certain features have been tucked away in areas that you wouldn't expect to find them, but the workflow in general is smooth, and the interface looks pretty slick. Inevitably, it's better suited to tablet-sized screens, but you can just about get away with using it on a phone. And of course, any projects that you do create on the go can be imported into the desktop version of FL Studio, so there's a chance that you might actually turn those commuting doodles into fully-fledged productions. FL Studio isn't the game-changing music-making app that a lot of Android users were hoping for, then, but it stacks up reasonably well against the competition. We're assured that updates are on the way, though it the software is ever to fulfil its potential, Google will have to get its act together on the audio front.